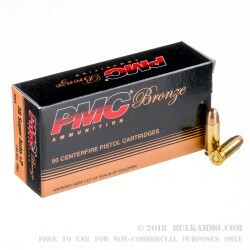 The increasingly popular .38 Super cartridge is now more widely available than ever thanks to this load from PMC. These cartridges use a 130 grain full metal jacket bullet and produce a muzzle velocity of 1,100 feet per second. 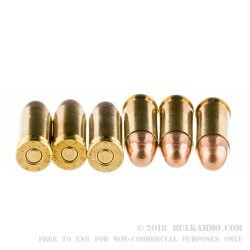 While this load does not take full advantage of the full performance potential of the .38 Super, the mild recoil it generates makes it an excellent target round for 1911s chambered in the cartridge. 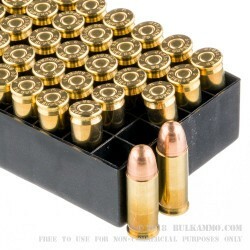 Each box contains 50 rounds in boxer-primed brass cases. 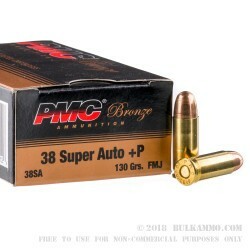 All .38 Super ammo is designated as +P to further distinguish it from the older, lower-pressure .38 ACP cartridge. This ammo is safe to fire in any gun chambered for .38 Super. PMC is a brand of Poongsan, a South Korean munitions company known for supplying the Republic of Korea Armed Forces. With PMC, Poongsan leverages its massive production capacity and advanced quality control measures to deliver high quality ammo that meets the performance and price requirements of US shooters.